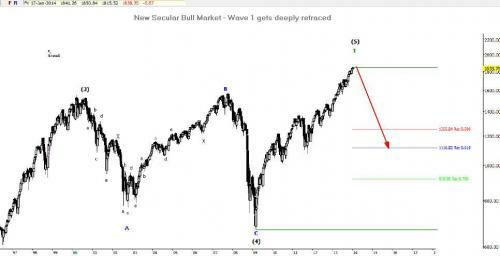 Three most likely wave counts all pointing to a cyclical bear market soon! March most likely top! 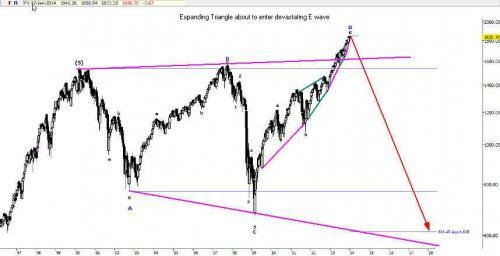 My favored wave count is expanding triangle. 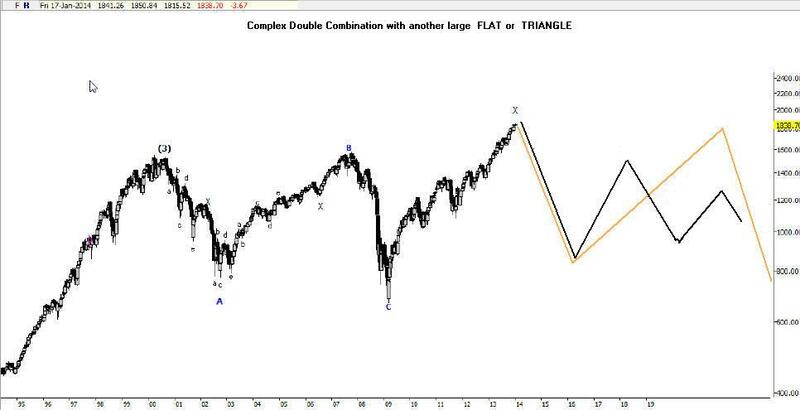 Here is more detailed analysis of my favored EW count. Expanding Triangles are monsters, fibonacci relationships are not consistant and sometimes completely absent. Contracting triangles are most often continuation patterns, expanding triangles the opposite is true leading to a reversal. 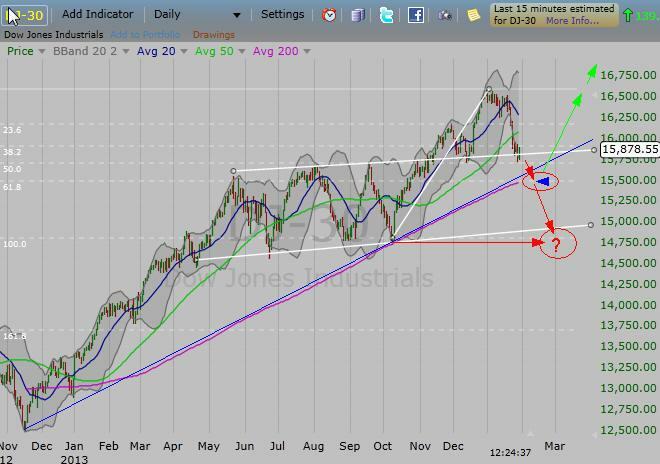 If this does complete as an expanding triangle with a huge Wave E down, this would spell a very dire outlook for the very long term future. First waves are often called seed waves and subsequent waves are related to it by Fibonnaci ratios. 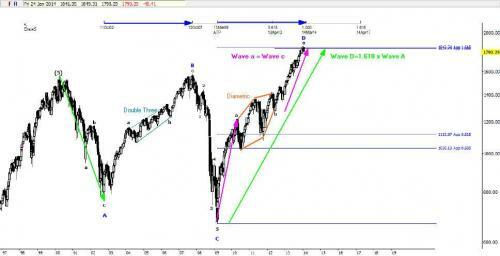 Wave D likely topped at exactly a 1.618 ratio to Wave A! This has a three wave structure with a beautifully symmetric b wave called a diametric. Wave c the final impulse of a 3 wave correction has a precise 1:1 relationship with Wave a that also converges tightly with the 1.618 of Wave D's relationship to Wave A. So pricewise there is tremendous resistance here although sometimes price pushes through, backtests and then collapses, you can see that as this wave unfolded it backtested the .5 and .618 Fibo supports. 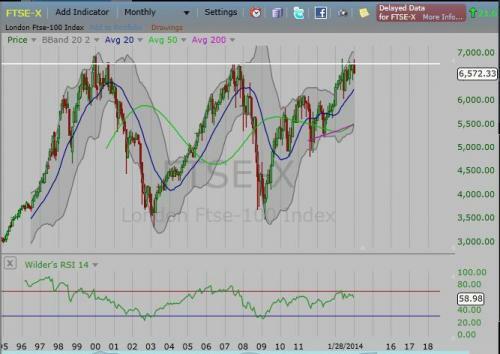 At top of the chart you see the Fibonacci Time relationships. The reason I am looking for another top in March which is the time equivalency to the B wave up during Bush. I am still hoping we sell off a ways here then come back up for a retest and "2B top" short trading set up! An E wave this size could be a wild ride but I am gonna at least try to saddle this bear and see how long I can stay on! 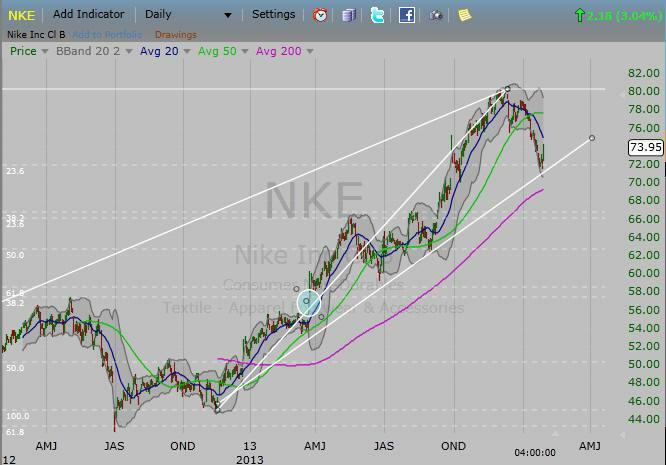 Nice SHORT SET UP; going in this morning if futures aren't too bad! Can't pass this one up. 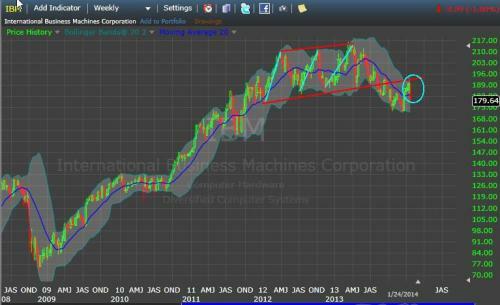 Another prime example of this shorting set up is the US Buck at its all time high! 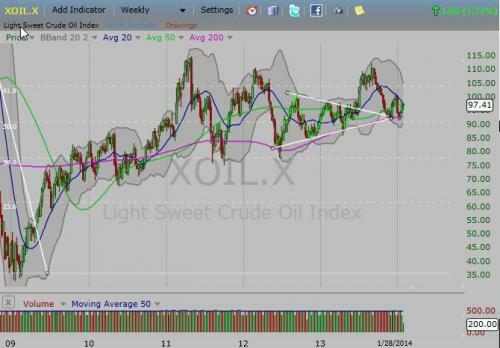 CRUDE ready to break down! See if I'm right by Spring but will be nice to see prices at pump go down below $3 ! 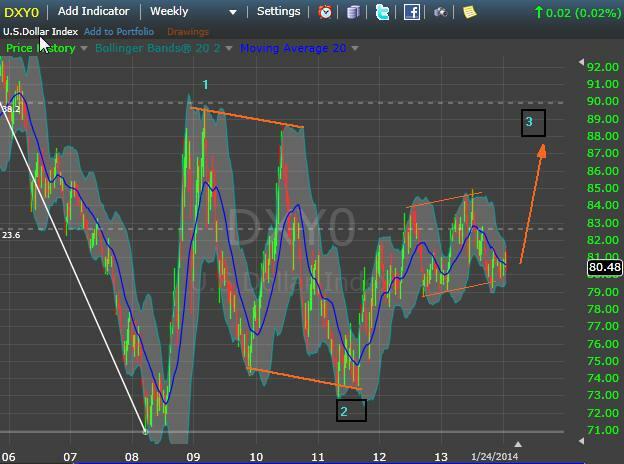 US Dollar basing since 2008 now with solidly bullish pattern for reversal and wave 3 move UP! Aussie Dollar and Canadian Dollar just broke huge support...not looking good for commodities. I am playing this one but lightly. Getting restless to trade but just gonna put my toe in, still think overall indices may have another rally up into March but if I see very good pattern set-ups going to nibble a bit! trendlines of larger structure. This sure is a beautiful one. 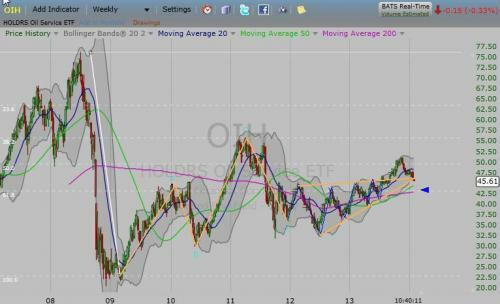 Anyway this is the end of a large corrective structure after the huge 2008 collapse and my expectation is for this to follow oil and go lower again, how much lower is impossible to determine.Of course I could always be wrong and oil starts trending back up as it usually does seasonally at this time. All I can say is from this EW structure what ever trend gets established in oil over the next few months should persist for some time, I don't expect crude to continue to stay rangebound that is for sure! OIH has strong supportive convergence @ 42-43 area with 50 and 200 DMA's , .618 FIBO, first confirmation will be it going below the triangle apex where it sits now! Then if it takes out the 42-43 we have confirmation of a resumption of the bear market in oil. Entered GLD long trade on Farley 5WD set up this morning. .50 and FIBO .68 retracements that converge at 114 drawn from both major impulse origins in bull impulse up. Also volume confirms pattern with progressively less volume on each low. So anyhow see if we get lucky here but first goal is top of last swing top or what hopefully will become what Farley calls the BIG W! See I am getting some "views" so will keep posting my nonsense. I log my trading for my own reference so I may as well do it here! wave structures in this crazy market that is for sure. 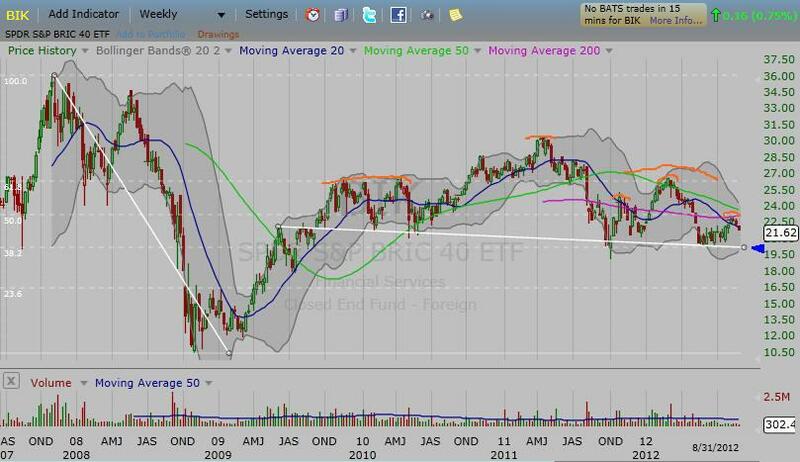 Looking for a topping formation here. Schizoid Stock. A lot of attention on BRIC's and several emerging with their currencies getting hammered. What a messy corrective structure (can't even stab at a wave count) post - 2008 impulse down. But other technical features looking bearish with large and small downsloping head and shoulders, watching 20 level neckline, this could be a great short if it gives! Will be good etf to short, keeping a close eye on things here for third watch failure or brief bull trap. Looking at a lot of other foreign markets today but this one really caught my eye! 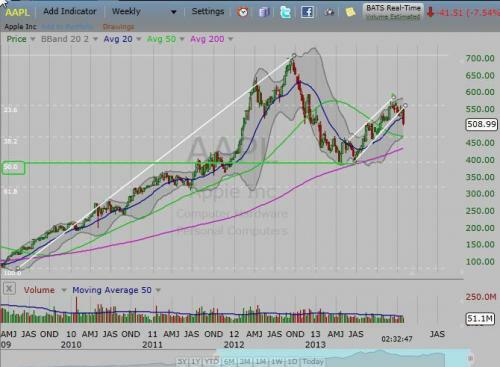 Some support here but much stronger supportive CV at 15,500-15,600. Critical that holds to get another rally into March and possible new high in Dow. If this doesn't hold and we plunge under 15,000, still wouldn't mean Dow has necessarily topped, just would be hard to see market rally from there to a new top in March but possibly April-May. 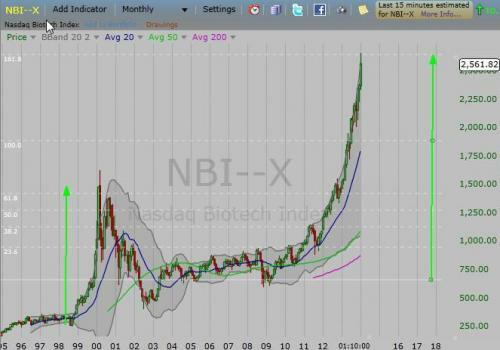 If it breaks below this area, the start of the last impulse up a First Rise/First Failure is in and that the top is in. But I really would like to see a wild pop to finish things off! NIKE has rolled over, first 5 WD decline almost complete. It could work its way back up close to high but this move down is first sign the top is in. On my short list but still early,will be plenty of good shorting set ups, but seeing a lot of wild topping patterns up here!